maattmoo: Time to go! Thanks for all who found him! 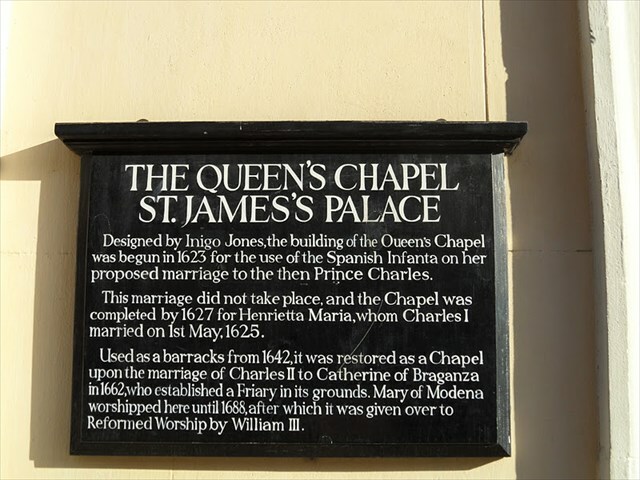 The Queen's Chapel is a chapel in London, that was built between 1623 and 1625 as an external adjunct to St. James's Palace for the Roman Catholic queen, Henrietta Maria. It was built as a Roman Catholic chapel at a time when the construction of Catholic churches was prohibited in England, and was used by Charles I's Catholic queen Henrietta Maria. From the 1690s it was used by Continental Protestant courtiers. It was built as an integral part of St James's Palace, but when the adjacent private apartments burned down in 1809 they were not replaced and in 1856-57 Marlborough Road was built between the palace and the Queen's Chapel. The result is that the chapel now appears to be more part of the Marlborough House complex than of St James's Palace. It became a Chapel Royal again in 1938. This is a short multi, and the final is just a short walk away, but is in an area that will need a good deal of stealth. There were two panels either side of the main doors.
" Used as a barracks... ABCD "
"Restored as a chapel on the marriage of Charles E "
"Mary of Moderna worshipped here until FGHJ "
And... " Was gived over to Reformed Church by William K "